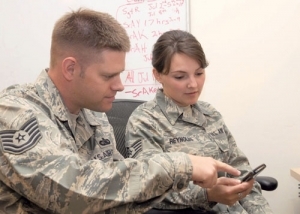 US Air Force implements stricter security for BlackBerrys | BlackBerry Blast! Users will no longer have the capability to send or receive text messages with attached photos or videos. Text-only messaging will remain enabled. If a device is being synched and its software is out-of-date, a "Force Load" message will appear. The user will only have one opportunity to decline updating the software. Any subsequent syncing attempts will render the device inoperative until the software is updated. Users will not be able to download additional applications to their devices over the Internet. Most Bluetooth functionality will be disabled. The only Bluetooth feature that will continue to function will be linking the device to the smart card reader cradle. Users will no longer be able to connect their smart card reader cradle to their computers.